Thankfully, the days of printing out your manuscript and sending it off to an agent are mostly over. Now days, all you need to do is email the file, or upload it using a form on the agent's website. But there are problems and gotchas involved. One of the biggest problems you may run into is file size. Many services will block large files from being emailed or uploaded. So, I'm going to discuss ways to shrink your file. But before I do, one warning. Never send a file to an agent unless the agent asks for it first. Many agents do not want to receive attachments to emails, and may delete the file unread. A typical Word doc or docx file for a completed novel will be about 300 to 400 kilobytes in size. That isn't very big and should upload just fine. But file bloat can happen, sometimes swelling files sizes to several megabytes or more. Once a file gets that big, you're going to have problems emailing or uploading it. In case you're not familiar with kilobytes and megabytes, one megabyte equals 1,000 kilobytes. Some computer systems may only display your file sizes in kilobytes, so if it tells you a file is 1,000 kilobytes (KB) than that's the same as 1 megabyte (MB). One thing that can bloat a Word file is if you have change tracking turned on. Especially if you've been working on the file for years. That's a lot of changes to track. If you do have a lot of changes being tracked, chances are you don't want to lose them. So, the first thing you should do is copy the file and give it a different name. This way you'll have two versions of the file; one with change tracking and one without. Then, in the copy, accept all changes, then turn tracking off. This should make your file a lot smaller. But, in some cases, it still isn't enough. If turning off change tracking didn't work (or you never had it turned on in the first place) then you'll need to take a more aggressive approach. But don't worry, it's still pretty easy. Create a new blank Word file, copy all the text from your old file and paste it into the new file. Save it and check the file size. Hopefully it is a lot smaller now. To quickly copy and paste your entire file contents, go to the original file and press Control+A (or Command+A on a Mac). This will select the entire file. Then press Control+C to copy (Command+C on Mac). Place your cursor inside the new, blank document and press Control+V (Command+V on Mac) to paste. Another solution, as mentioned by ikmar in the comments below, is to perform a Save As command, and save your file as an RTF file (Rich Text Format). The nice thing about RTF files is that they have very little overhead information that can bloat your file, but still keeps any formatting you may have applied. So, basically, saving as an RTF will flush out any extra unnecessary data. Then all you need to do is open the RTF file in Word, and then perform another Save As command, this time saving it back to the standard Word format of docx. You should now have a new, thinner version of your original file. Thanks to ikmar for the suggestion. But what if your file contains images, like for a picture book? Images will bloat your file size like nothing else. So, you need to be really careful with them. Luckily Word comes with a built-in image compressor that can help. It will reduce the size of all your images, thus reducing the size of the overall file. To use it, go to the File menu and click Reduce File Size. In some older versions of Word, you'll find it under the Format tab. To be safe, only perform this command on a copy of your file. Just in case something goes wrong. In order to reduce the file size, Word will have to reduce the quality of the image. It's a tradeoff that can't be avoided. But you can experiment with the different options to see which settings give you the best results without losing too much quality. Here's a sample of the pop-up window you'll see when you run the Reduce File Size command. The Picture Quality option is the one you'll want to experiment with. But always leave Delete cropped areas of pictures checked. Also, make sure to check the option for Apply to: All pictures in this file. 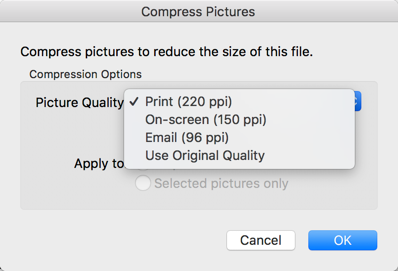 The options for Picture Quality are Print, On-screen, and Email. 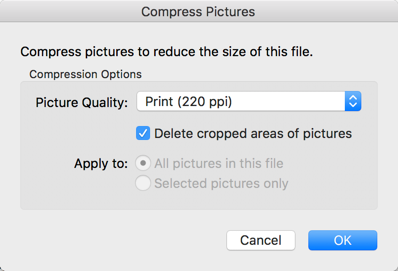 Print probably won't save you much file size, so you can ignore that one. First try Email, as it will reduce file size the most. But it will also reduce quality the most, so after running it, check your images to make sure they are not too blurry or jagged. If you don't like the way they look, try the On-screen option (but start with a new copy of your original file.) It won't reduce your file size as much, but hopefully it will be enough, and your image quality won't be reduced as drastically. You're trying to get your file size below 2 megabytes or so. So, if you have to go with a little less quality to do that, then you can add a note to the agent explaining that the quality was reduced for sending. She'll understand. You may also be tempted to turn your Word file into a pdf. There was a time when this was almost a requirement, because it was a file type that all computers could read. But a pdf, especially one with embedded images, can be significantly larger than a native Word file. And, since Word has become a standard, there is no reason to change your doc or docx files to a pdf, unless the agent specifically requests it. You can always save it as a pdf and send whichever file turns out smallest.